Permanent magnets are used in many electric motors and generators. These devices come in all sorts of shapes, sizes, configurations and complexity, but their basic operating principles are much the same. We’ll demonstrate one of the simplest electric motors we’ve seen yet. It uses a few paperclips, some insulated wire, an AA battery and a magnet. It’s not terribly efficient or useful – you won’t see one of these in your electric car anytime soon! It does, however, include all the relevant parts and ideas that you’ll find in most electric motors. It’s a great educational tool: simple, inexpensive and entertaining. We’ve seen it used for classroom demonstrations, and even a contest where Physics students built these motors to see whose could spin the fastest! 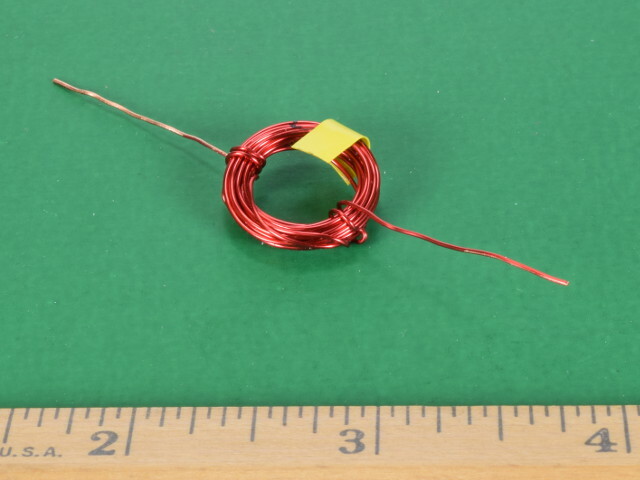 A coil of magnet wire is carefully wound as the motor's rotor (spinning part). First, we’ll take a length of 24 gauge Magnet Wire and construct the rotor. Take several feet of this wire and construct a loop of wire as shown. To keep the size of the coil constant, wrap the wire around a pen or other cylindrical object. Anywhere from 10 to 35 turns seems to work well. We wound this coil around an AA battery, which was a nice size. Leave the two ends of the wire sticking out from either side of the coil. You can tape or wrap something around the coil in a few places to keep it together. 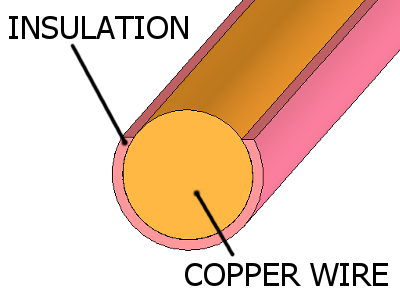 Magnet Wire: Single strand copper wire that has a very thin layer of insulation. Found here. Rotor: The spinning part of an electric motor. On one side, the insulation is only partially removed. Your rotor is a single length of wire, mostly wound in a coil, with the two ends of the wire sticking out at either end. On one side, remove all of the insulation, on the length of wire sticking out from the coil. We did this by lightly scraping it with a knife, all the way around the wire. Here’s the important part: On the other side of the coil, only remove half of the insulation as shown. This part is critical to control the flow of electricity, switching it on and off as the wire rotates. We scraped the insulation off with a knife without rotating the wire. Scrape a stripe off it, but leave the rest intact. We used alligator clips to connect two AA batteries in series to the paperclips. Now let’s construct the stator. Using two paperclips, construct a holder that will hold the rotor. The distance between the clips should be shorter than the ends sticking out of your rotor. Set them in a base of wood, Styrofoam, or whatever else you have handy to hold them still. Connect the ends of your battery (or several batteries in series) to the two paperclips. One paperclip is connected to the negative side of the battery. The other paperclip is connected to the positive side. Set the DC4 magnet beneath the rotor. The best position might vary, depending on the angle between your rotor’s coil and where exactly you scraped the insulation off. We secured the magnet with a piece of Scotch tape, since it kept sticking to the steel paperclips and alligator clips. Stator: The part of an electric motor that stays still. It is the stationary base that does not spin. The last step is to set your rotor onto the stator, a.k.a. 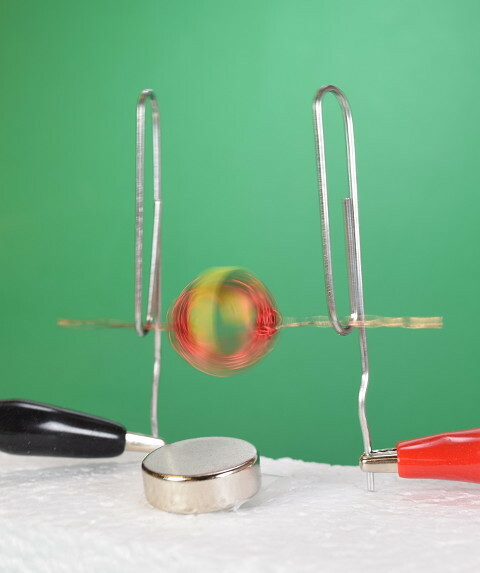 set your coil of wire onto the paperclips, and watch it spin! The coil makes electrical contact with the paperclip, allowing a current to run through the coil. The coil is an electromagnet. We love this demo because it clearly shows the basic principles of electric motors. There isn't a lot of fancy circuitry complicating matters. Let’s break down the rotation of the spinning coil into a few steps to try and figure out what's going on. This motor assembly really has two magnets. One is the DC4 permanent magnet taped to the base. The second is the coil that temporarily becomes an electromagnet when electricity is flowing through it. If we imagine that the coil's contacts were scraped completely clean of insulation on both ends, what would happen? The coil of wire acts like a little electromagnet. 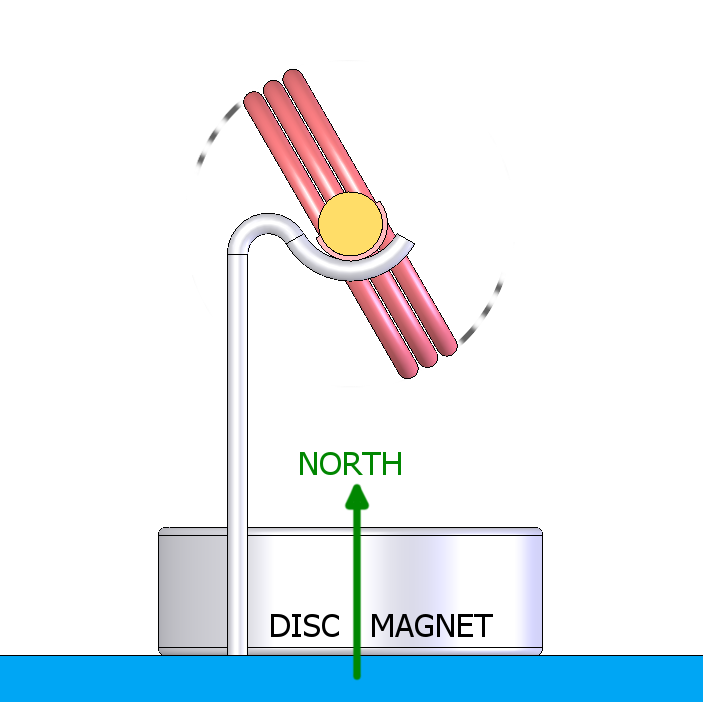 In the presence of the magnetic field from the stationary magnet on the base, the coil is going to rotate to align itself with the magnetic field. 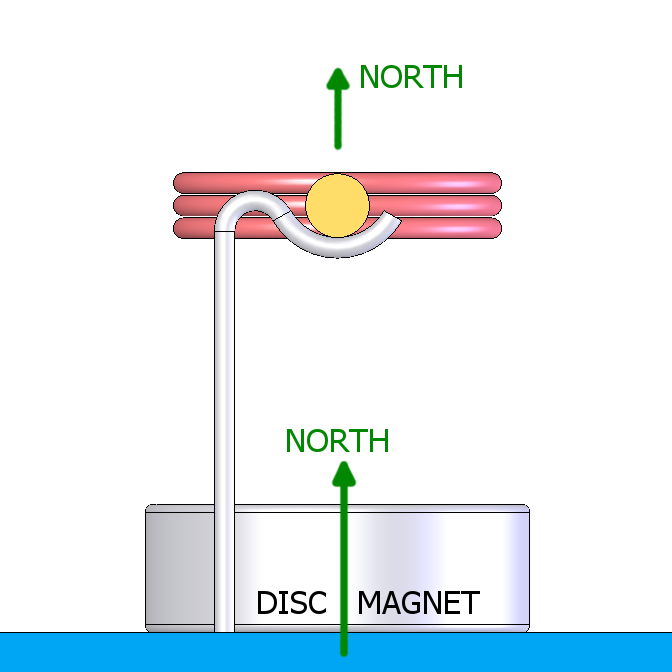 If the base magnet is set with the north pole facing up, then the coil’s north pole will face up. This is going to be true to matter what rotational position it starts out from. With current flowing through the coil, it will feel a torque that twists it to align. Now consider the rotor where we’ve ingeniously scraped off only some of the insulation. What happens as this rotates? Let's consider four positions describing one rotation of the coil. In position 1, there is electrical contact, so the coil is an electromagnet. 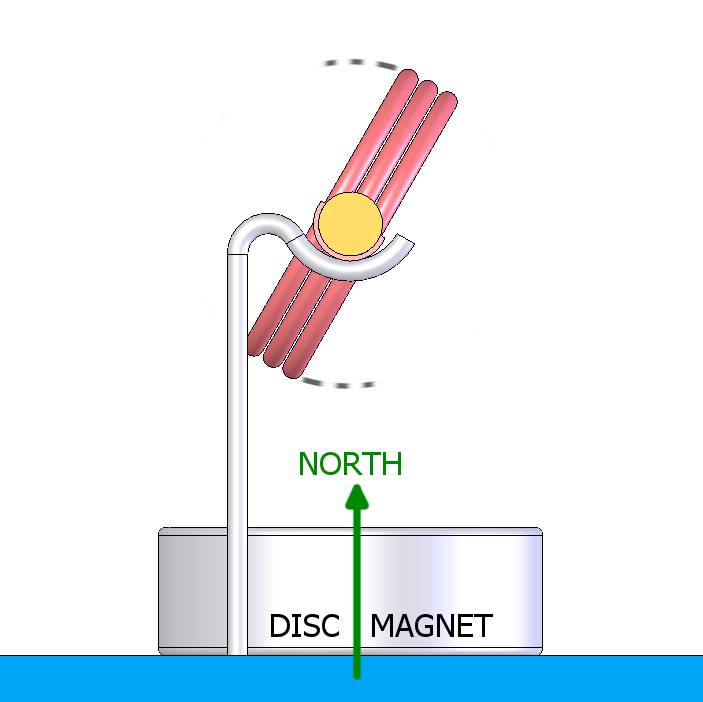 Because its north pole isn’t aligned with the base magnet, it feels a torque that gets it spinning. In position 2, electrical contact is maintained between the paperclip and the coil, so current keeps flowing through the wire. 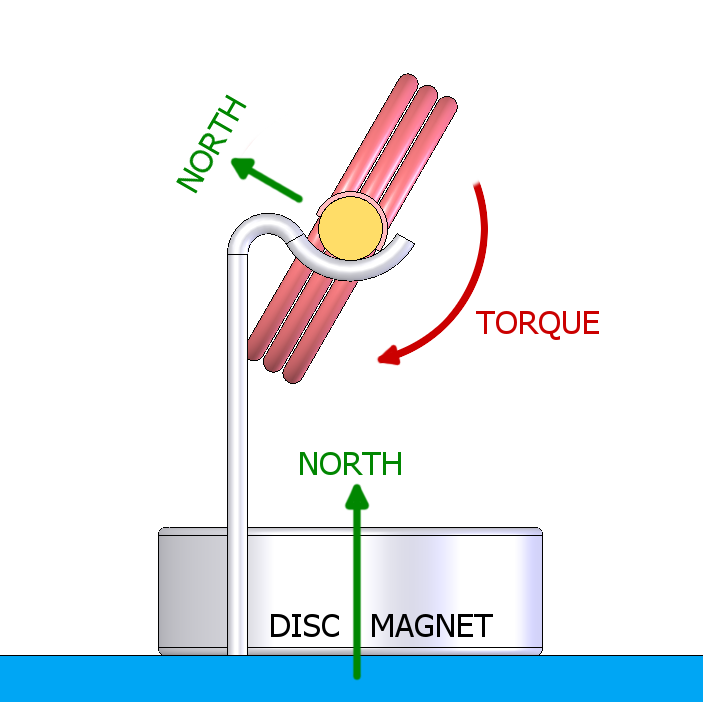 Since the north pole still isn’t aligned with the base magnet, a torque continues rotating the coil. In position 3, the coil has rotated past the point where electrical contact can be made. With insulation touching the base, no current flows through the coil. It stops acting like an electromagnet. It keeps spinning because it has some momentum from the previous steps. Zoom close in on the picture to see the thin layer of insulation preventing electrical contact between the coil and the paperclip support. In position 4, there’s still no electrical contact. The coil will only keep spinning if it has enough momentum. If the spinning coil makes it back to the point where it can make electrical contact, the cycle begins anew. One thing we didn’t mention in the assembly instructions: Balance. This hand-wound rotor made isn’t balanced like a Swiss watch. If it’s too imbalanced, it might not spin freely enough to keep spinning. If it can’t keep spinning through the part where no electrical contact is made, it won’t work. If you’re having trouble getting it to spin, disconnect the battery and see if you can get it to spin well when you flick it by hand. Experiment with bending the wires a bit to improve the balance. It doesn’t have to be perfect, but the smoother it rotates, the better the motion and electrical contact will be. We tried smaller, ½” diameter magnets, but they didn’t seem to provide enough magnetic field to really get it spinning in our tests. The stronger, ¾” diameter magnets worked best. If the magnet is going to see a lot of handling and abuse, consider plastic coated DC6PC-BLK plastic coated magnets instead of the plain DC4 magnets. 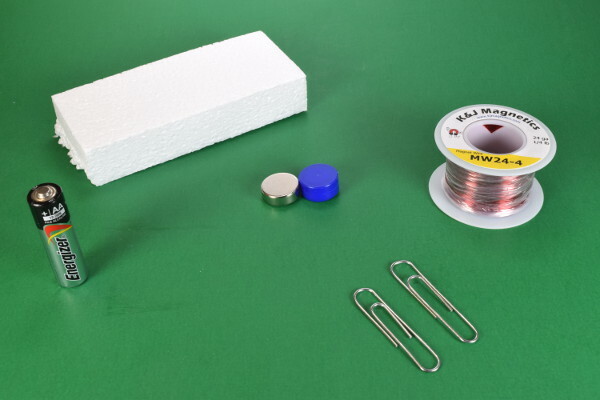 Neodymium magnets are made of such a hard and brittle material, the plastic coated ones might be more durable in the hands of students. Be careful! These strong magnets are powerful and may not be appropriate for young ones. 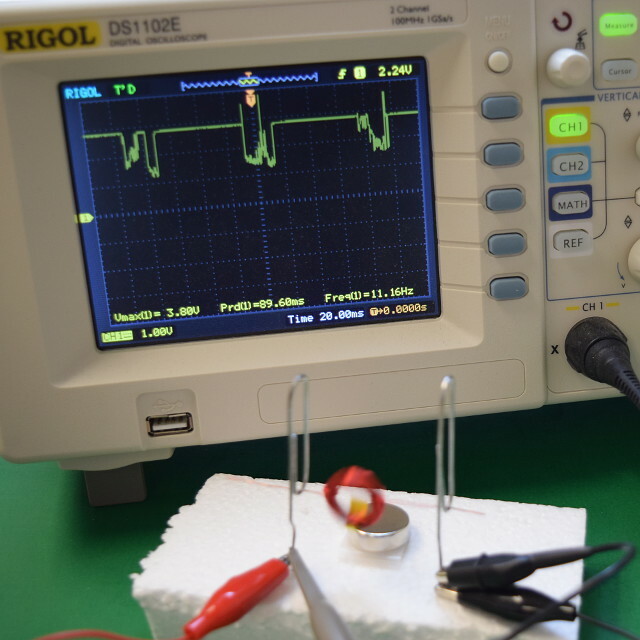 An oscilloscope shows the voltage drop across the paperclips when the coil makes electrical contact. There are a number of ways to measure the performance of a simple motor like this. We used an oscilloscope to measure the voltage across the two paperclips. It clearly shows when the small length of magnet wire in the coil is making an electrical connection, essentially shorting out the battery. From this, we can measure how quickly the rotor spins. In the photo, the scope shows that the rotor is spinning at about 11 Hz, which is nearly 700 rpm. Sweet! The 3V supplied by two AA batteries drops to about 1.5V when the coil makes contact and completes the curcuit. As you might expect from a small, light, bouncing bit of wire, the electrical connection is far from clean. It's noisy and bouncy, and definitely does not make great contact. It's good enough to spin it, though! We’ve presented the basic idea as a starting point for your own experiments or classroom demonstrations. What questions can you build a scientific investigation around? There are so many good ideas! Pose your own scientific hypothesis and do a bit of testing to see what reallly happens. How does the number of turns of wire affect performance? 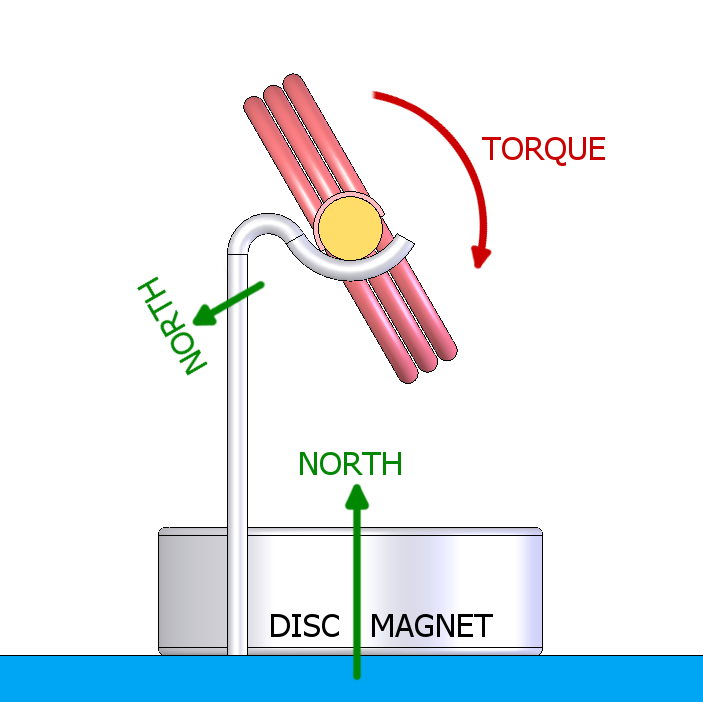 More turns makes a heavier rotor, but also a stronger electromagnet. How does the size and position of the base magnet affect performance? Stronger field strength in the region of the coil means more torque. 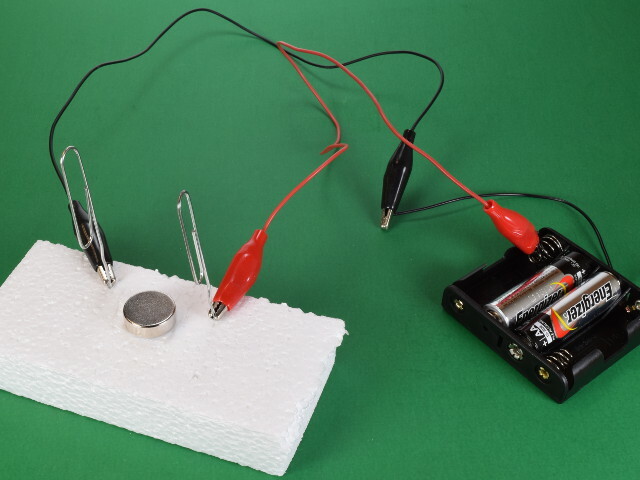 Try smaller or larger magnets, and also adjust their distance to the coil. Can performance be improved by using two magnets, one above and below the coil? How does varying the voltage affect performance? Add more batteries in series to try 1.5V, 3V, 4.5V, 6V, etc. Does using a different magnet wire gauge change performance? How does the size of the coil affect performance?